I don’t like all the work in maintaining a perfect lawn—mowing, re-seeding, weeding – and watering the lawn seems wasteful. Our dog also does not help the cause. In our book, Gardening from a Hammock, we were advised by several gardeners to “ditch the grass”. 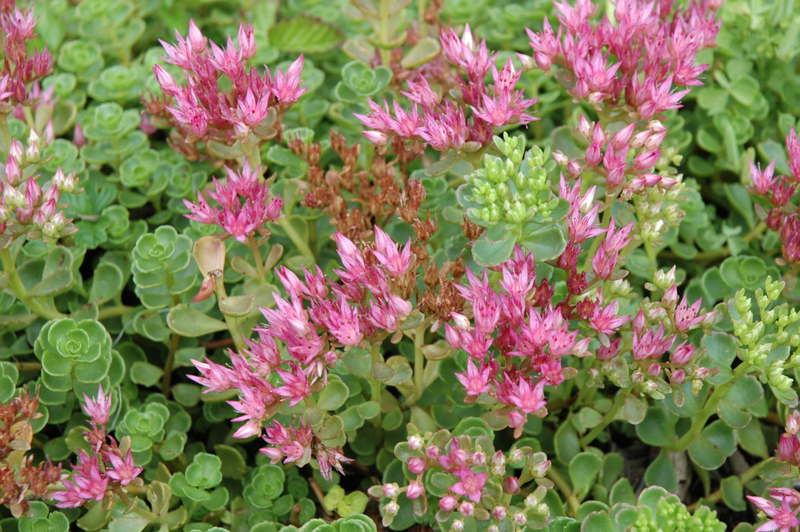 Commonly called stonecrop, like many sedums, this is low growing, only about 5-10 cm and is a fast-growing groundcover, spreading 25-30 cm. ‘John Creech’ provides a green carpet of tiny rounded deep-green leaves with small clusters of pink star-like flowers in late spring through early summer. in containers where it will cascade over the sides.